P.I.HELP Injury Clinics now offers free transportation to and from their clinics to better serve patients that have been in a personal injury accident. 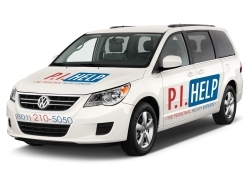 Salt Lake City, UT, April 05, 2019 --(PR.com)-- P.I.HELP Injury Clinics announced that they now provide free transportation to patients who need rides to and from the clinics after a personal injury accident. P.I.HELP Injury Clinics found that many patients were missing doctor and physical rehabilitation therapy appointments because they didn’t have reliable transportation, they were afraid to drive after their car accident or that their vehicle was being repaired at the body shop after their car accident. “We saw this trend in missed appointments so we came up with a solution to offer free transportation for our patients,” said Dr. Bryn Bradley, chiropractor at P.I.HELP Injury Clinics. P.I.HELP Injury Clinics makes transportation to and from their clinics effortless and reliable by taking care of all the planning, so their patients can make it on time to their appointments. Patients don’t have to have a smartphone or knowledge of how to navigate ride-hailing apps to take advantage of this free service. Rides are scheduled on behalf of patients by utilizing on-demand, ride-hailing companies. Information about the vehicle and driver is communicated to patients via text message or a phone call so that patients feel safer and more comfortable with their ride. “We hope that this service will provide a comfortable and reliable transportation option for patients who have suffered a personal injury accident so that we can get them on the road to recovery,” said Bradley. P.I.HELP Injury Clinics offer physical rehabilitation therapy and chiropractic care to personal injury patients in a bilingual English/Spanish setting in Salt Lake City, Utah.